Designed for the keen gardener looking to grow seeds or cuttings in volume, this unit is one of the easiest propagators to use and delivers great results. 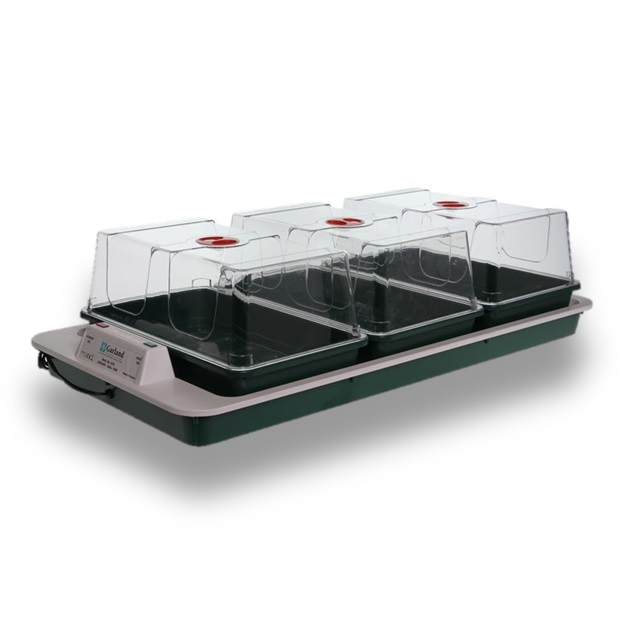 The unit is supplied with 3 large high dome propagators, each 36.5cm long by 22cm wide, and generates a temperature of 19ºC. It also has a convenient 'Heat On' and 'Power On' neon light indicators to tell you when the temperature has been reached. This advanced propagator unit has been designed to grow seeds or cuttings, the Big 3 propagator is easy and simple to use and is supplied with 3 large high dome propagators - each 36.5cm long by 22cm wide. The size of the unit lends itself to use in a greenhouse or spare room table top. The heated base contains a 50 Watt carbon fibre element for even heat distribution and features an inbuilt fixed temperature thermostat designed to maintain a compost temperature of 19ºC. The unit features 'Heat On' and 'Power On' neon light indicators to tell you when the specified temperature is reached (19oC). Note: The increased heat of the room can decrease the time it takes for the 'Heat On' indicator to come on.